Sally's Window of Scraps . 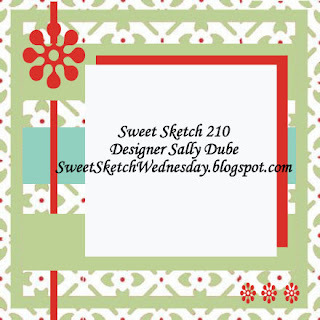 : Sweet Sketch Wednesday 210!! Hi there friends - Happy Wednesday!! As I write this post I can hear the rain coming down... a sound I do love to hear. It's been raining most of yesterday and today so, I do think we are destined to have a wonderful weekend for Father's Day, at least that's my wish...! Wednesday means it's time for a new Sketch Challenge over at Sweet Sketch Wednesday - YaY!! This week our Sponsor is a new one Stamp-n-Doodle!! Here's a brief Bio from the Owner: I started Stamp-n-doodle with rubber images about 6 years ago and have expanded into Clipart, Digital images, and scrapbooking. I am am also an exclusive designer for cards, etc. on Craftsuprint. Stamp-n-doodle is an on-line only digital/rubber stamp, scrapbooking & clipart web store along with our Challenge Blog (Blog-a-doodle). 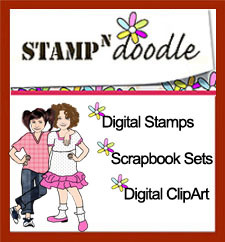 Whether you only want to create on your computer or combine your creations with traditional items, Stamp-n-doodle has it all. They have a wide variety of images and are offering this week's Winner 2 Free digis!! Be sure to play along!! 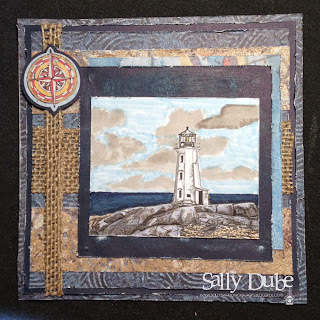 I definitely hae Cape Cod on my mind this week - our big Father's Day celebration is coming up so I chose this image Calm Seas and created a card for one of the men in my life. The papers and Burlap "ribbon" are from Close to my Heart. I hope you will join us with your creations!! Hi Sally I just knew you would choose this image, it's perfect. Love your colours and design papers it makes an amazing masculine card. Love this sketch this week thanks once again. Take care and have a great week. That burlap adds extra interest to your card this week. I hope that you get your wish of warm weather for Father's Day. Have a great week. Awww, I wish we were the ones getting the rain. Hopefully, the rains will get here early this year. I love the burlap that you have added to your card. It gives it such a nice effect. Love the lighthouse. have a great week. I am so tired of all the rain! It is so wet and soggy outside. Your card is super, love the image as well as the burlap. Have a great weekend hopefully we will get lots of sunshine. Beautiful, how absolutely beautiful! Love that image and the burlap. It adds such wonderful texture. What a great card and that burlap really is great with this image. Cape Cod has always been on my list to go to. Enjoy! Oooh, moody card! I think it is amazing. So different to certainly my usual style. You have put this one together perfectly. Tuesday Throwdown and The Stamping Chef!